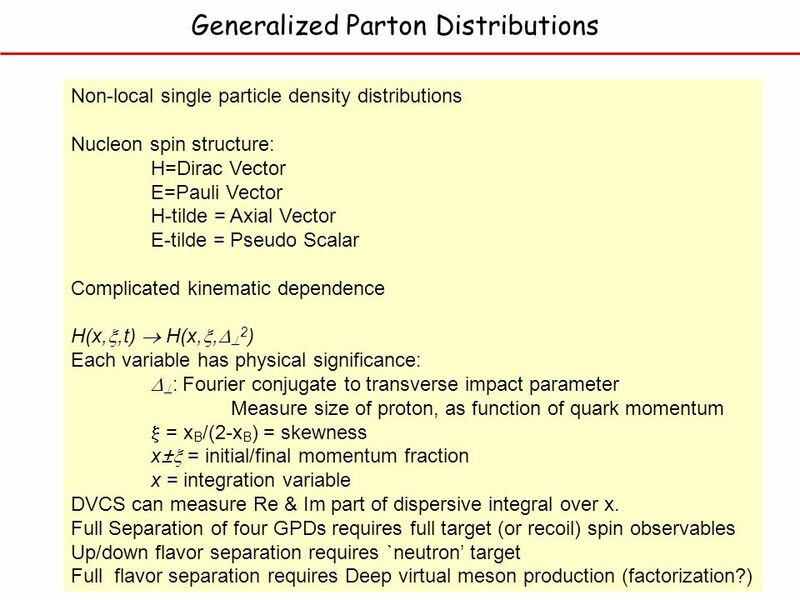 Outlook for Generalized Parton Distributions and Deeply Virtual Compton Scattering in Hall A Charles E. Hyde-Wright Old Dominion University, Norfolk VA.
2 Recent Hall A Results H(e,e )p: –Phys. Rev. Lett. 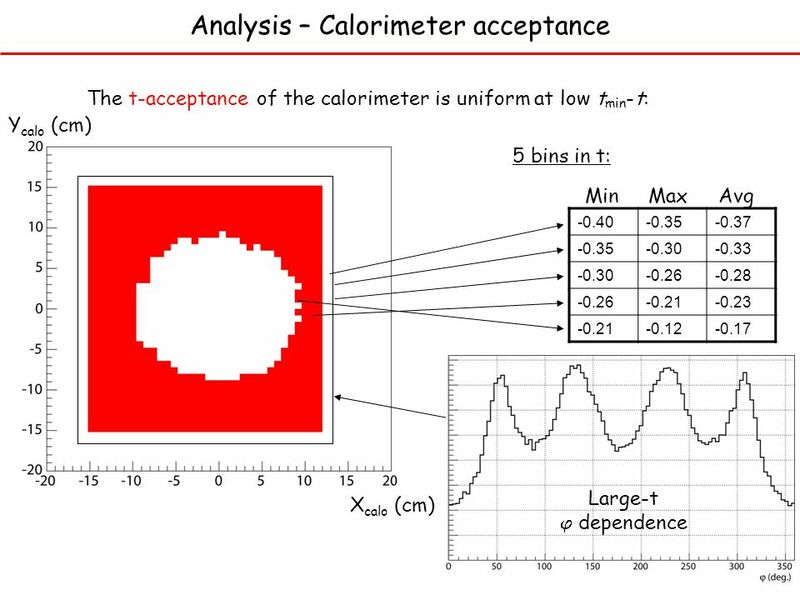 97, 262002 (2006): Dec 31, 2006 –Scaling test –Im[BH*DVCS] –Re[BH*DVCS]+ DVCS 2. H(e,e 0 )p: –Preliminary cross section results D(e,e )X:X<pn –Preliminary helicity dependent cross sections. 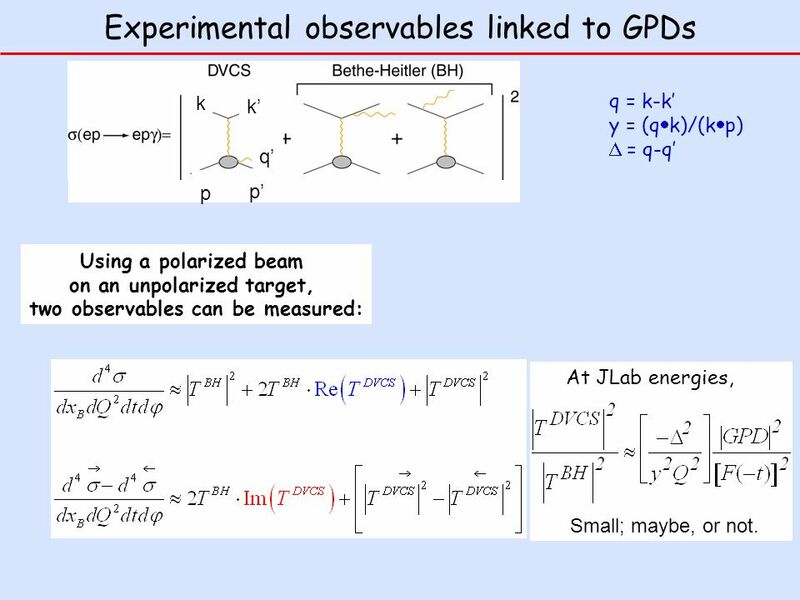 3 Using a polarized beam on an unpolarized target, two observables can be measured: Experimental observables linked to GPDs k k p p q q = k-k y = (q k)/(k p) = q-q At JLab energies, Small; maybe, or not. 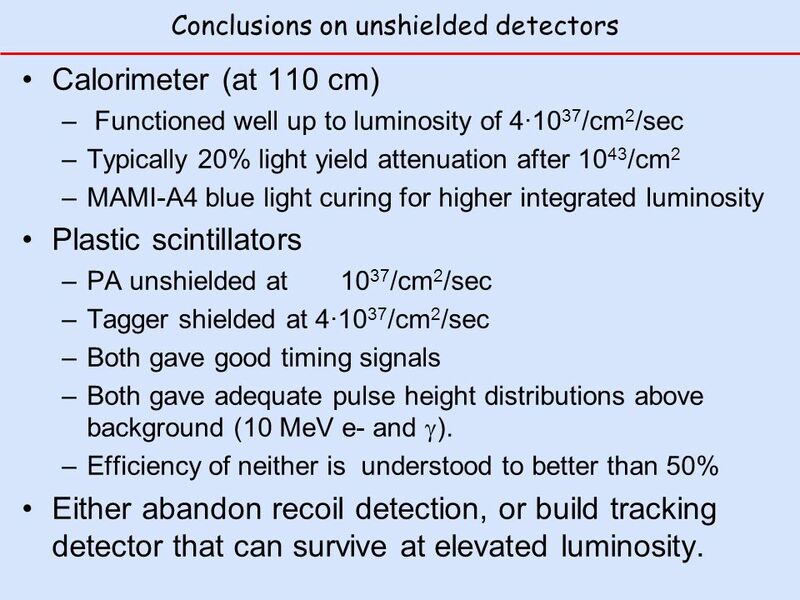 11 Conclusions on unshielded detectors Calorimeter (at 110 cm) – Functioned well up to luminosity of 4·10 37 /cm 2 /sec –Typically 20% light yield attenuation after 10 43 /cm 2 –MAMI-A4 blue light curing for higher integrated luminosity Plastic scintillators –PA unshielded at 10 37 /cm 2 /sec –Tagger shielded at 4·10 37 /cm 2 /sec –Both gave good timing signals –Both gave adequate pulse height distributions above background (10 MeV e- and ). 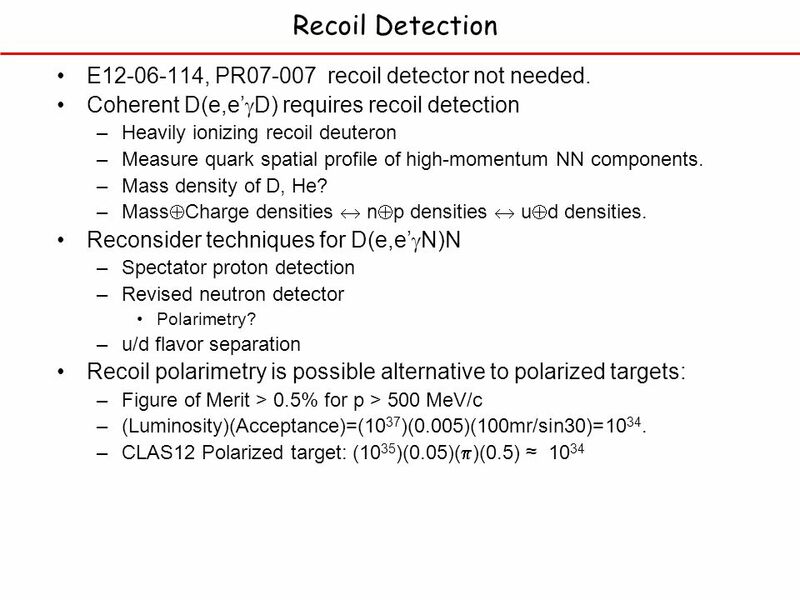 –Efficiency of neither is understood to better than 50% Either abandon recoil detection, or build tracking detector that can survive at elevated luminosity. 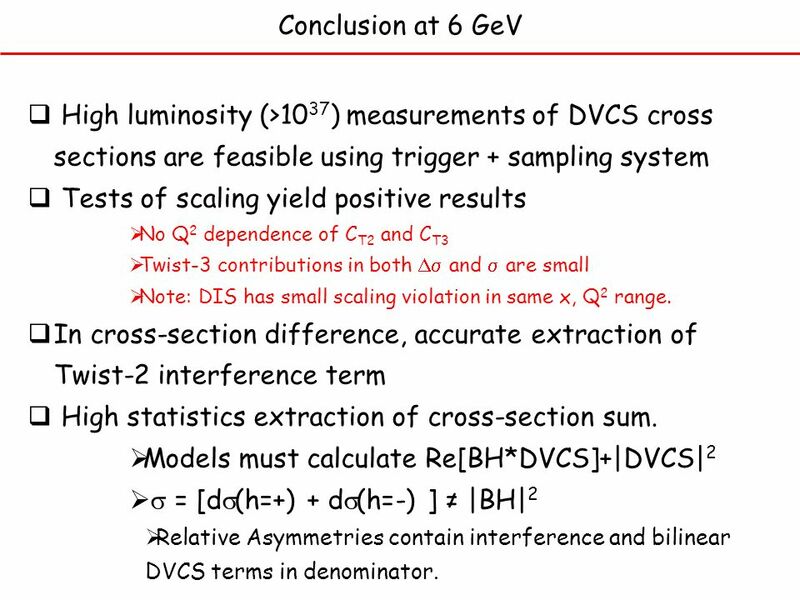 19 Conclusion at 6 GeV High luminosity (>10 37 ) measurements of DVCS cross sections are feasible using trigger + sampling system Tests of scaling yield positive results No Q 2 dependence of C T2 and C T3 Twist-3 contributions in both and are small Note: DIS has small scaling violation in same x, Q 2 range. In cross-section difference, accurate extraction of Twist-2 interference term High statistics extraction of cross-section sum. 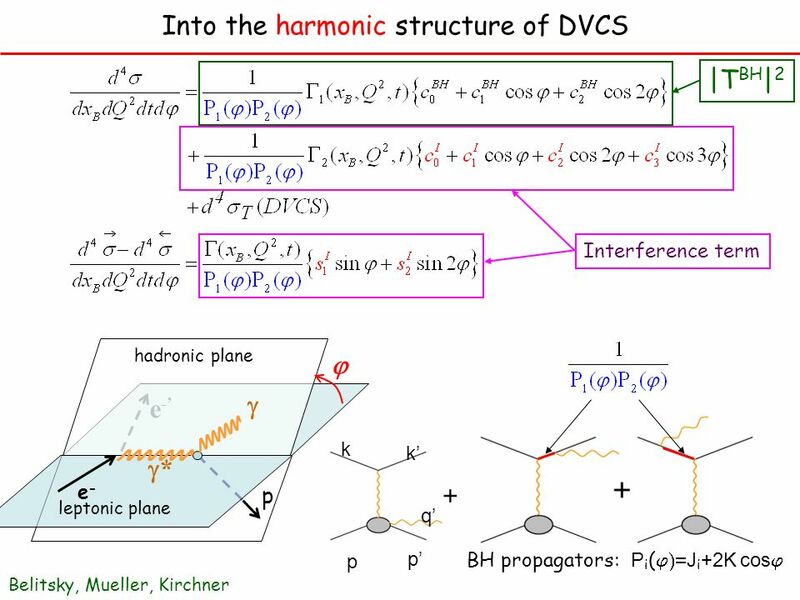 Models must calculate Re[BH*DVCS]+|DVCS| 2 = [d (h=+) + d (h=-) ] |BH| 2 Relative Asymmetries contain interference and bilinear DVCS terms in denominator. 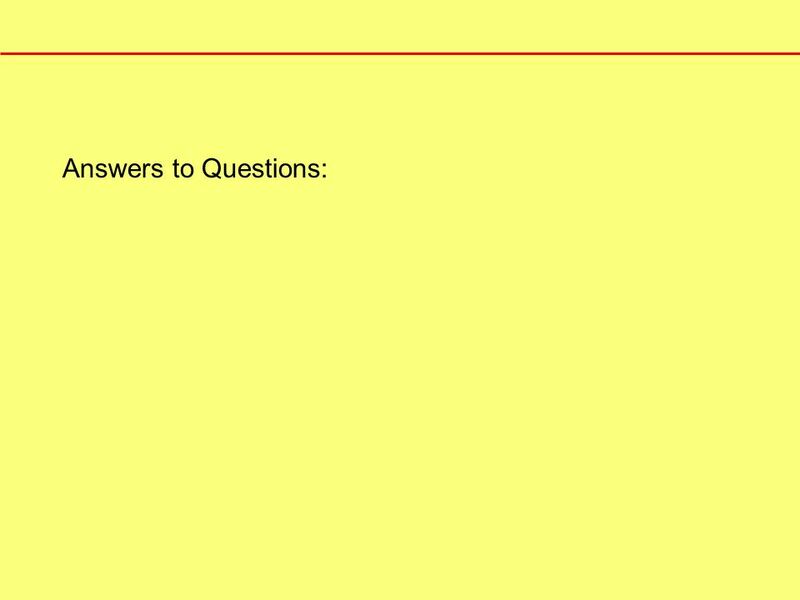 27 Can we measure the Ji Sum Rule? No! 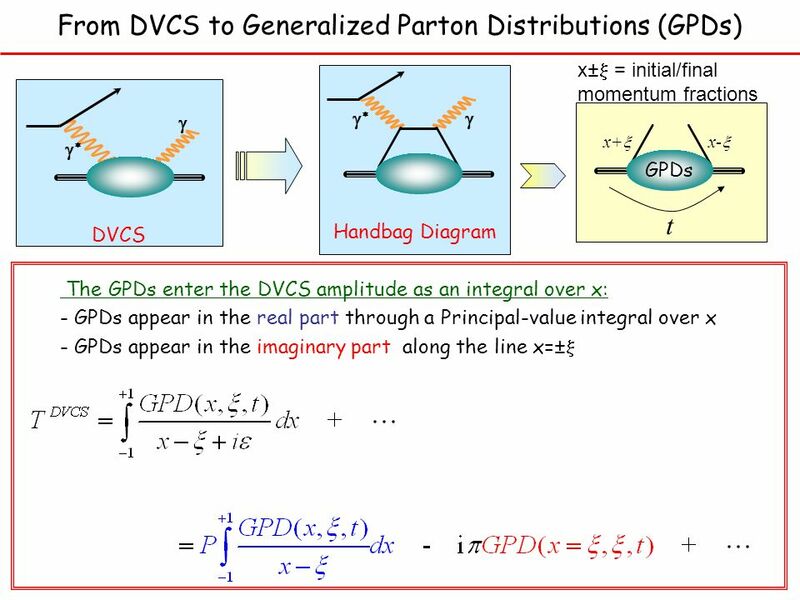 Purists Requirements –Flavor Separations –Extrapolate to t = 0 –Integral is independent of (polynomiality), but requires fixed GPDs. What can we measure? 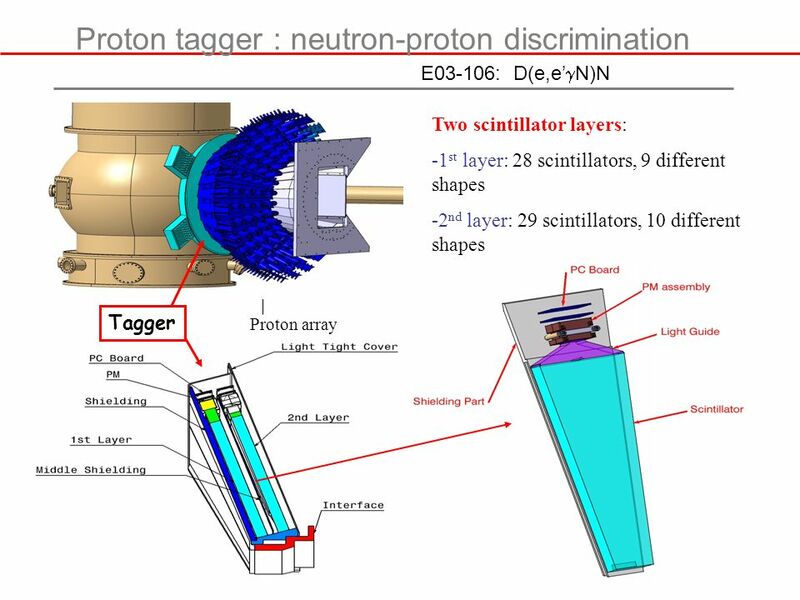 –Flavor unseparated H(±,x,t), E(±,x,t), P dx H(x,,t) /( -x) +… –Partial flavor separation with neutron target? 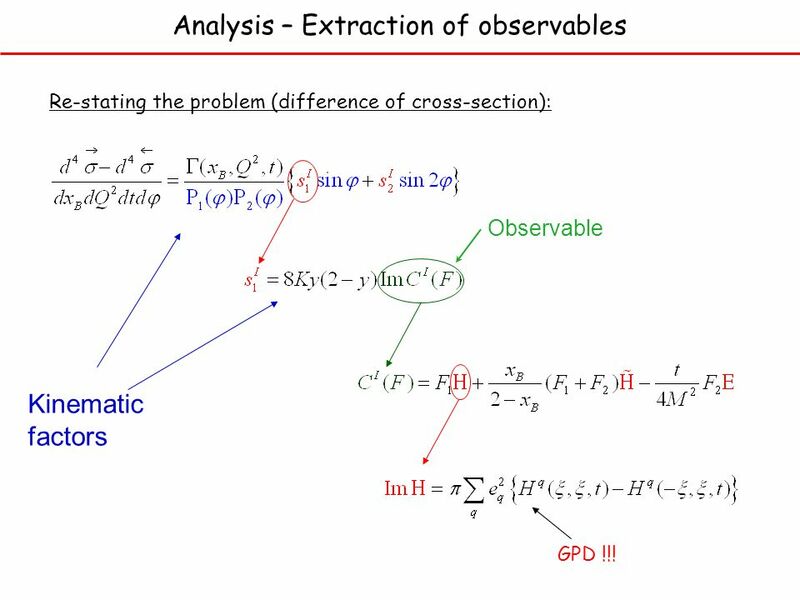 Theory input –Need more advanced models of GPDs –Full Empirical constraints, Form-Factors, Forward Parton Distributions –Full Theory constraints Polynomiality (x n moments are polynomials in ). 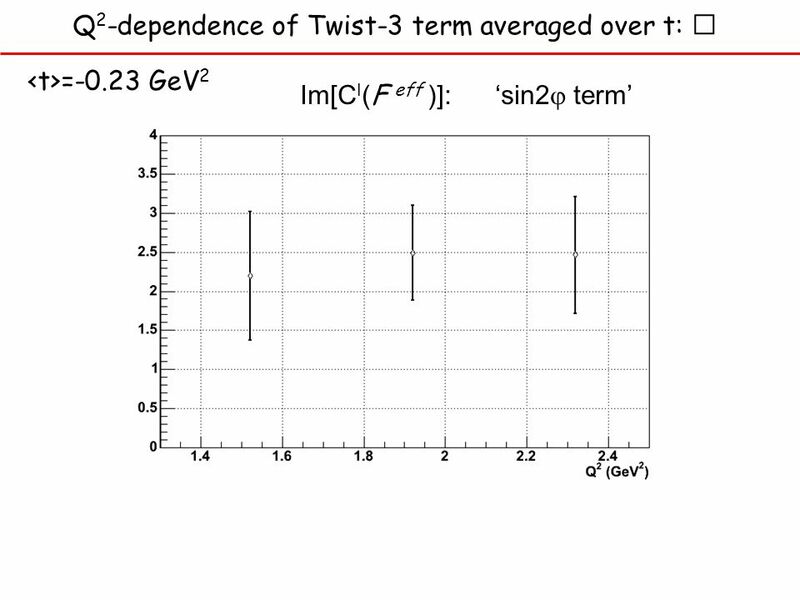 Positivity bounds –Lattice QCD input? 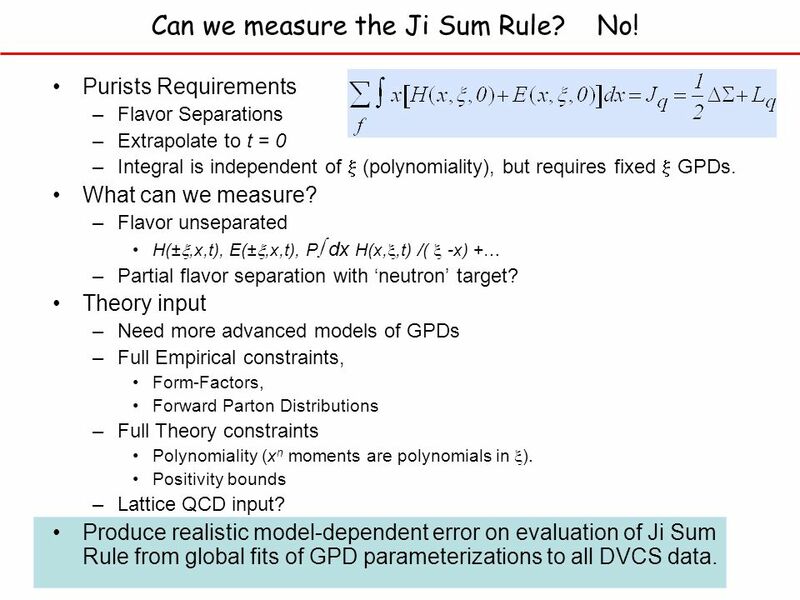 Produce realistic model-dependent error on evaluation of Ji Sum Rule from global fits of GPD parameterizations to all DVCS data. 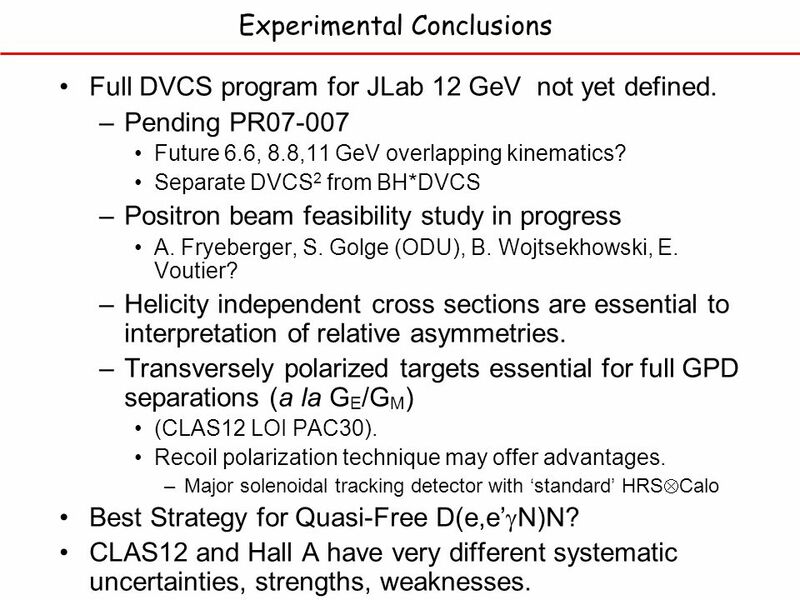 32 Experimental Conclusions Full DVCS program for JLab 12 GeV not yet defined. –Pending PR07-007 Future 6.6, 8.8,11 GeV overlapping kinematics? 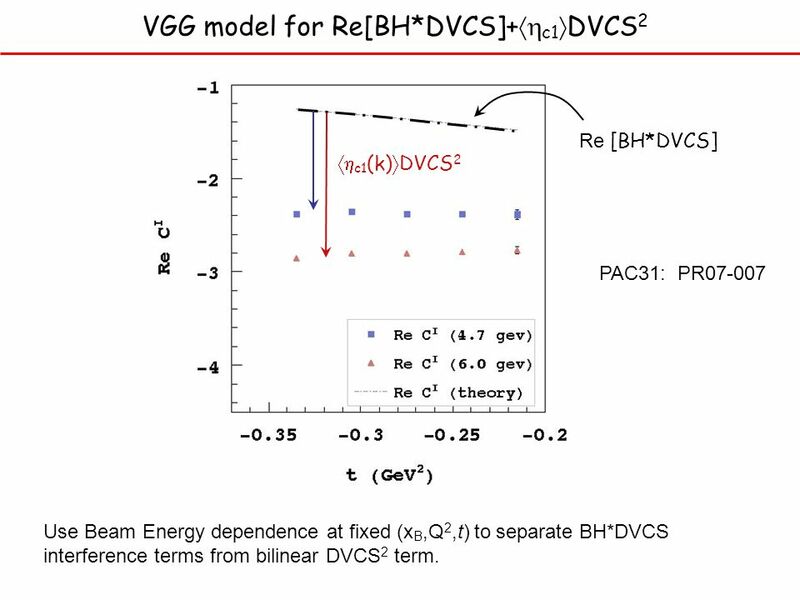 Separate DVCS 2 from BH*DVCS –Positron beam feasibility study in progress A. Fryeberger, S. Golge (ODU), B. Wojtsekhowski, E. Voutier? 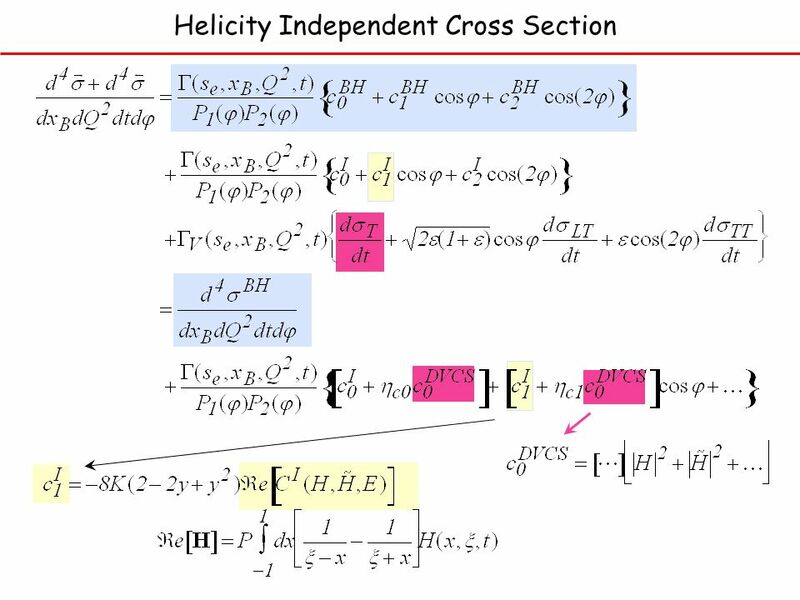 –Helicity independent cross sections are essential to interpretation of relative asymmetries. 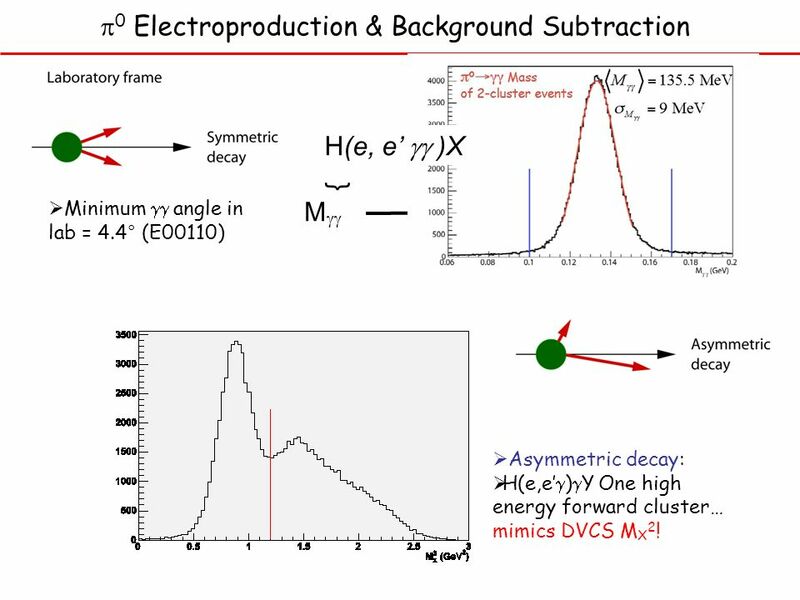 –Transversely polarized targets essential for full GPD separations (a la G E /G M ) (CLAS12 LOI PAC30). 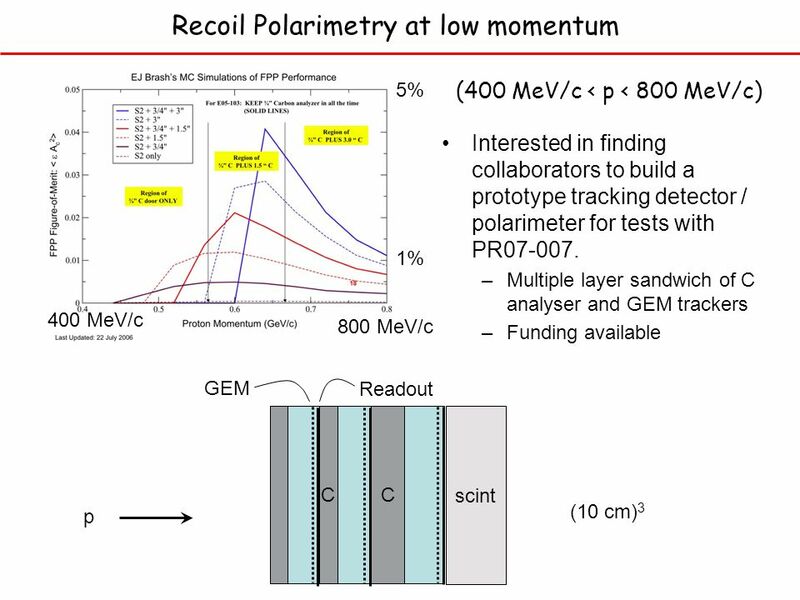 Recoil polarization technique may offer advantages. 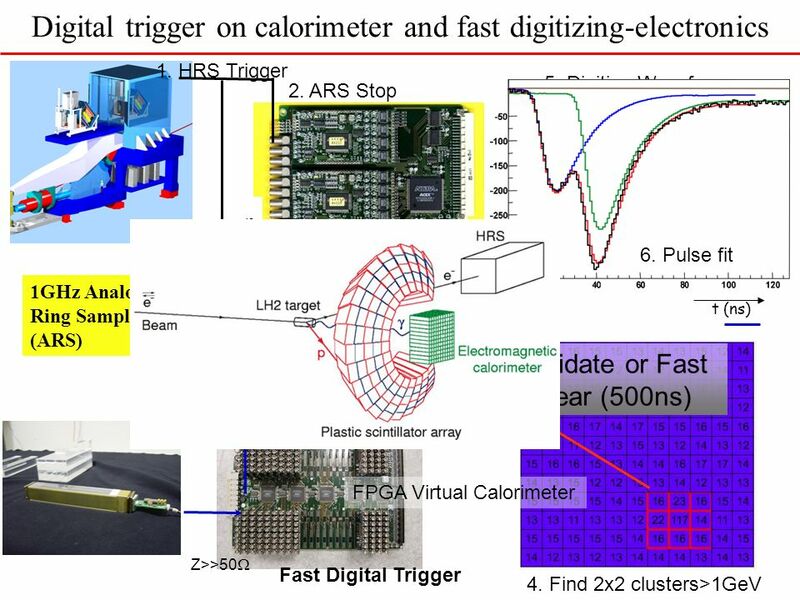 –Major solenoidal tracking detector with standard HRS Calo Best Strategy for Quasi-Free D(e,e N)N? 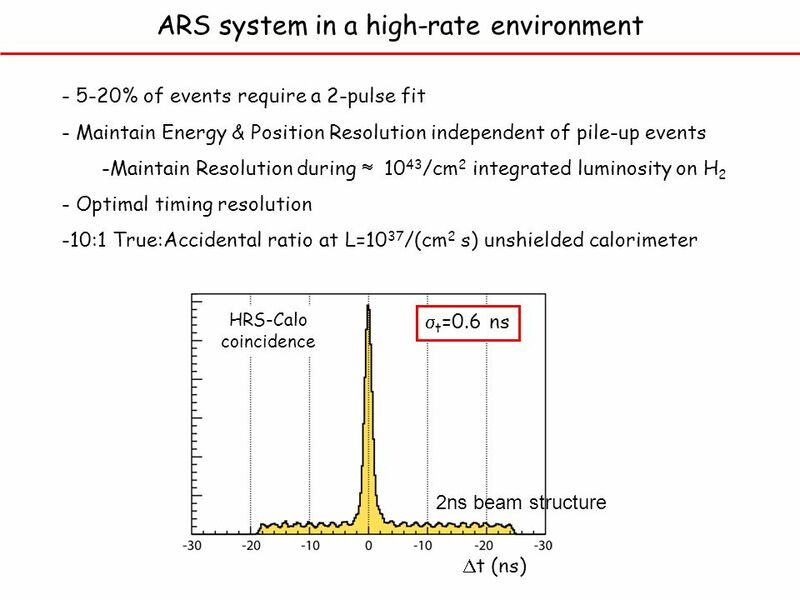 CLAS12 and Hall A have very different systematic uncertainties, strengths, weaknesses. 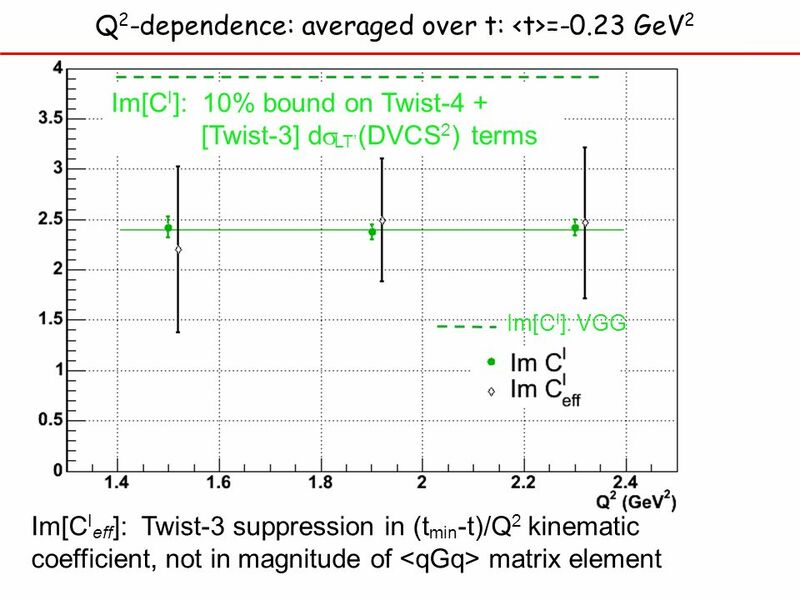 33 Physics Conclusions Leading twist (GPD) terms must be extracted empirically from Q 2 dependence of Twist-2 (+4+6…) observables. 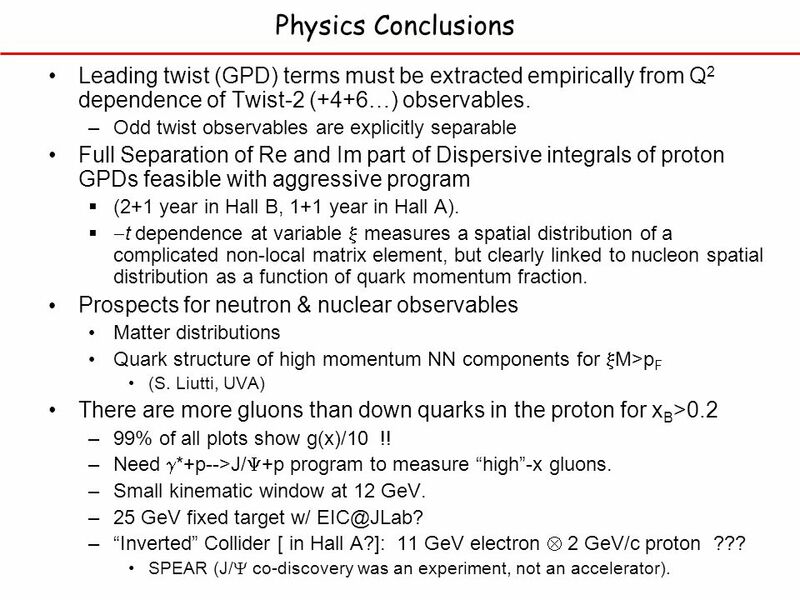 –Odd twist observables are explicitly separable Full Separation of Re and Im part of Dispersive integrals of proton GPDs feasible with aggressive program (2+1 year in Hall B, 1+1 year in Hall A). 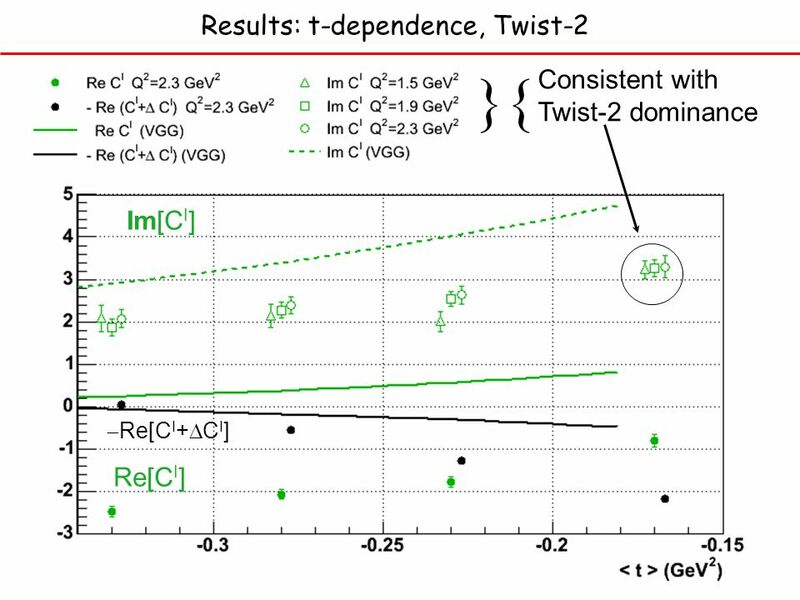 t dependence at variable measures a spatial distribution of a complicated non-local matrix element, but clearly linked to nucleon spatial distribution as a function of quark momentum fraction. 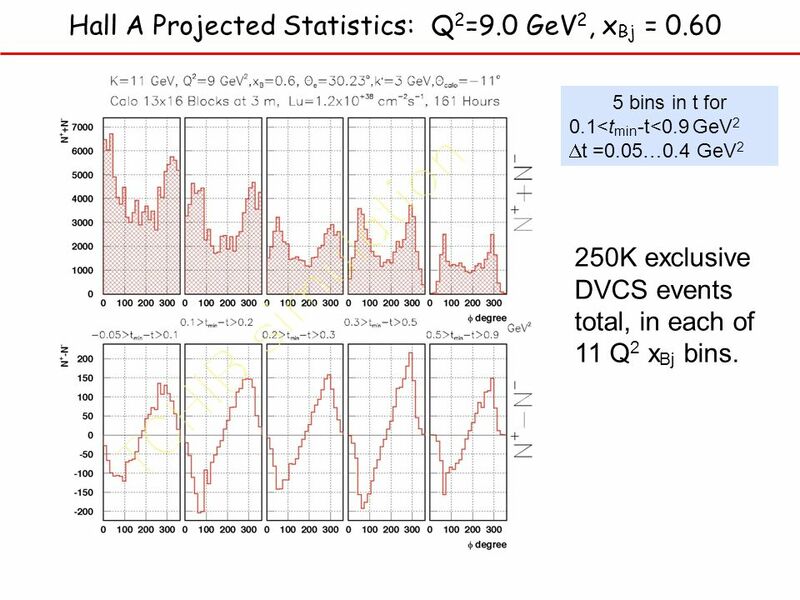 Prospects for neutron & nuclear observables Matter distributions Quark structure of high momentum NN components for M>p F (S. Liutti, UVA) There are more gluons than down quarks in the proton for x B >0.2 –99% of all plots show g(x)/10 !! 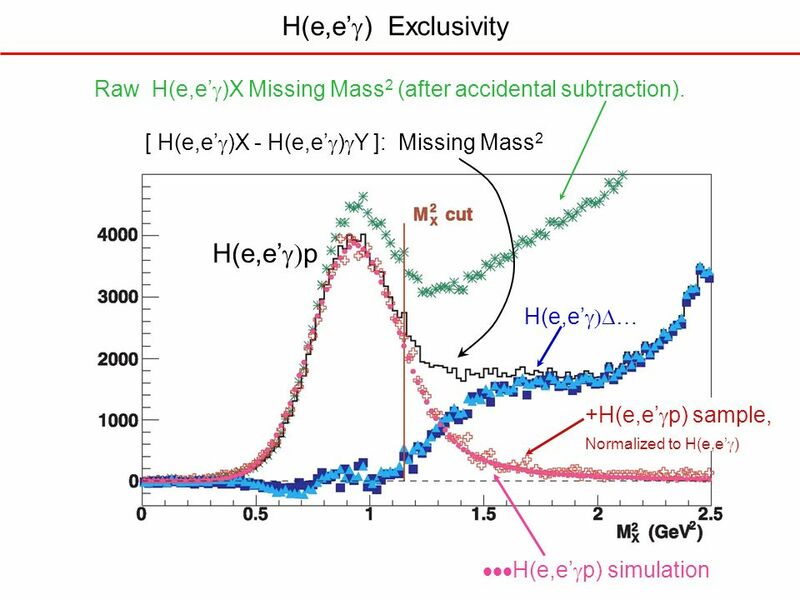 –Need *+p-->J/ +p program to measure high-x gluons. 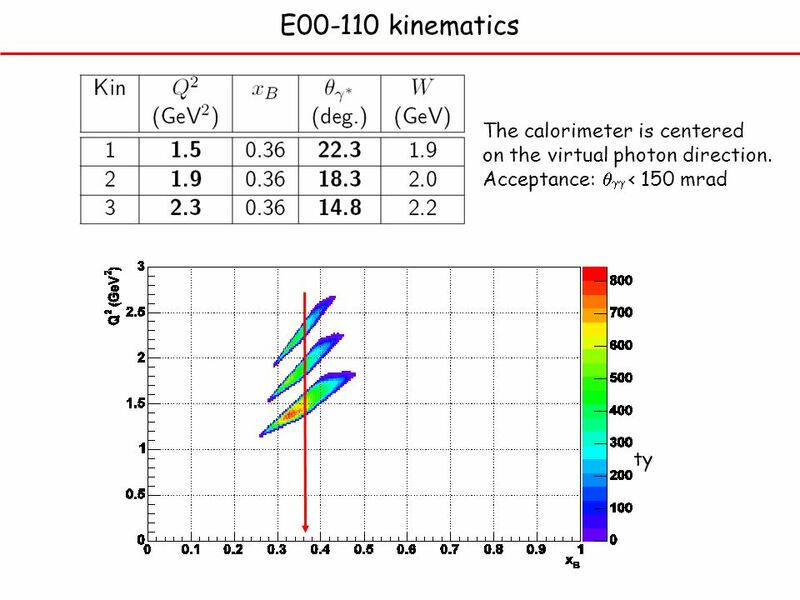 –Small kinematic window at 12 GeV. 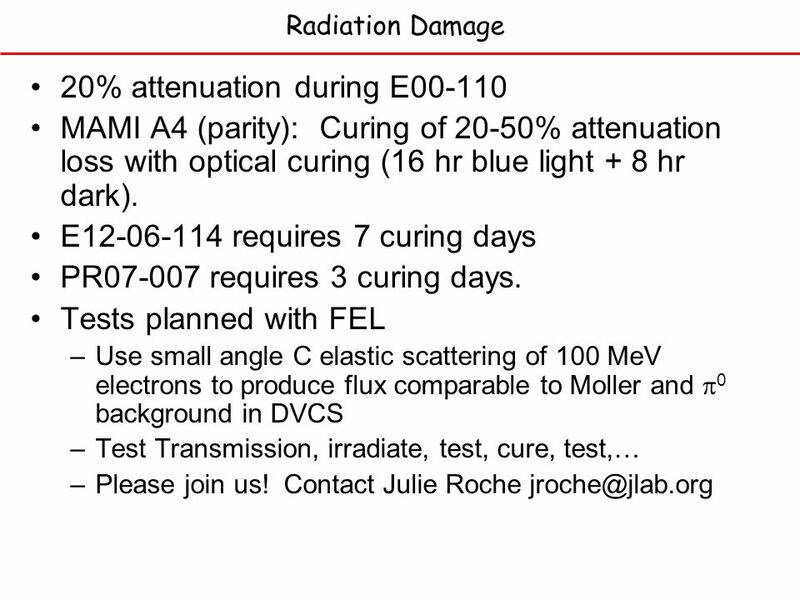 –25 GeV fixed target w/ EIC@JLab? 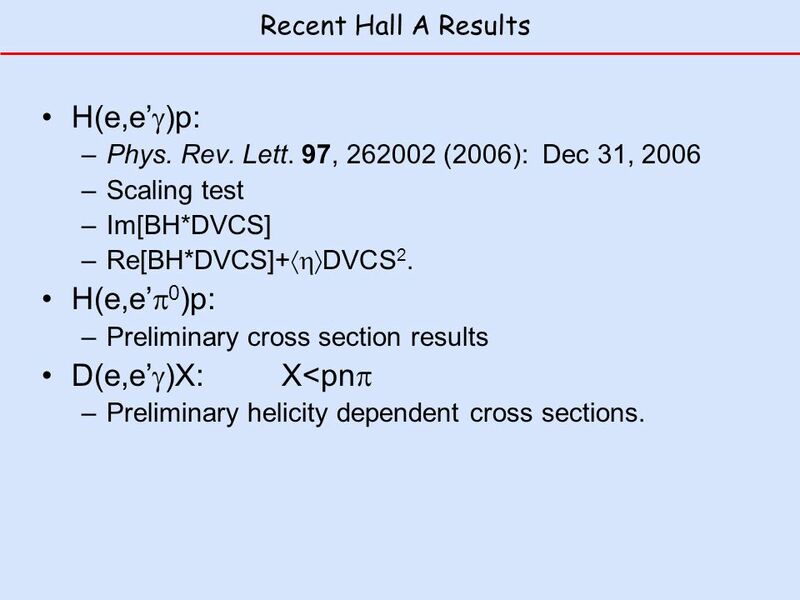 –Inverted Collider [ in Hall A? 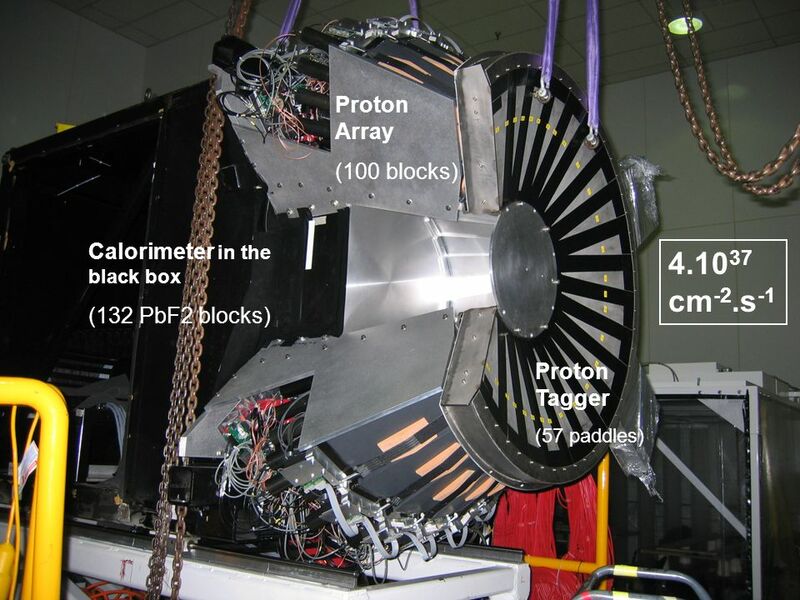 ]: 11 GeV electron 2 GeV/c proton ??? SPEAR (J/ co-discovery was an experiment, not an accelerator). 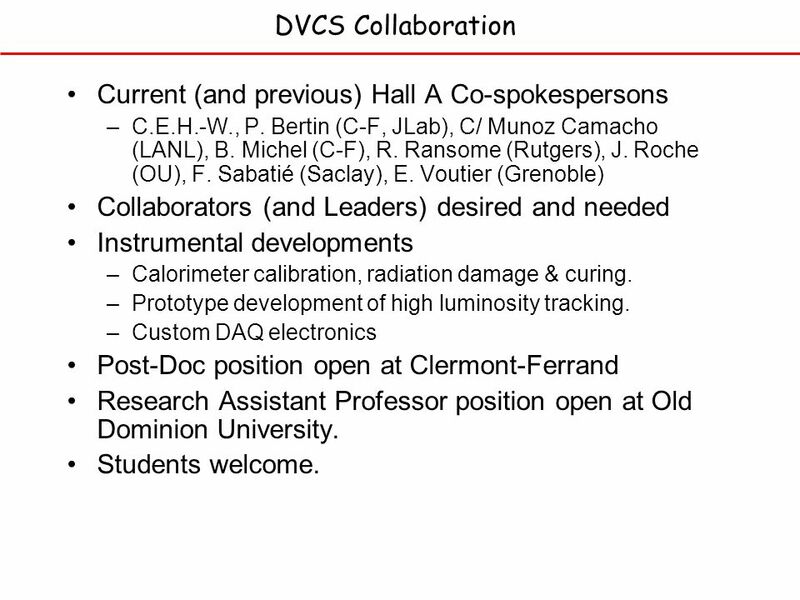 34 DVCS Collaboration Current (and previous) Hall A Co-spokespersons –C.E.H.-W., P. Bertin (C-F, JLab), C/ Munoz Camacho (LANL), B. Michel (C-F), R. Ransome (Rutgers), J. Roche (OU), F. Sabatié (Saclay), E. Voutier (Grenoble) Collaborators (and Leaders) desired and needed Instrumental developments –Calorimeter calibration, radiation damage & curing. 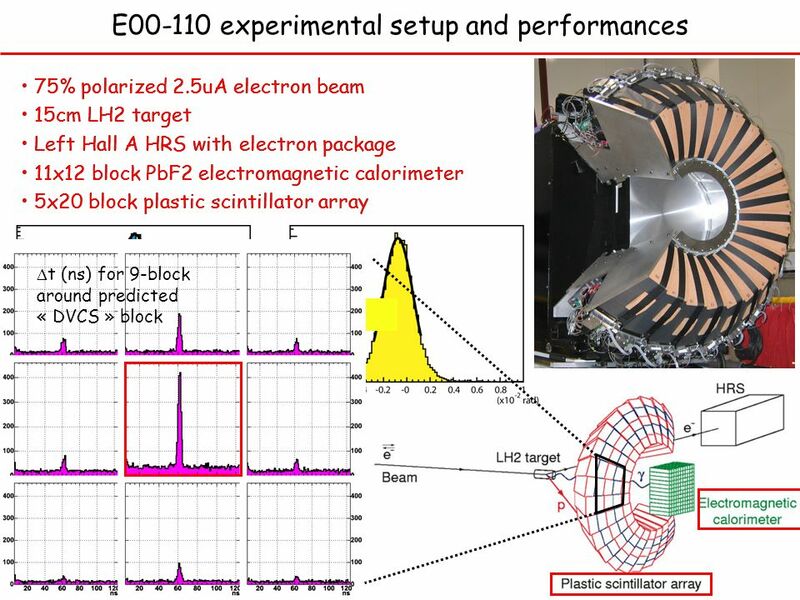 –Prototype development of high luminosity tracking. –Custom DAQ electronics Post-Doc position open at Clermont-Ferrand Research Assistant Professor position open at Old Dominion University. Students welcome. 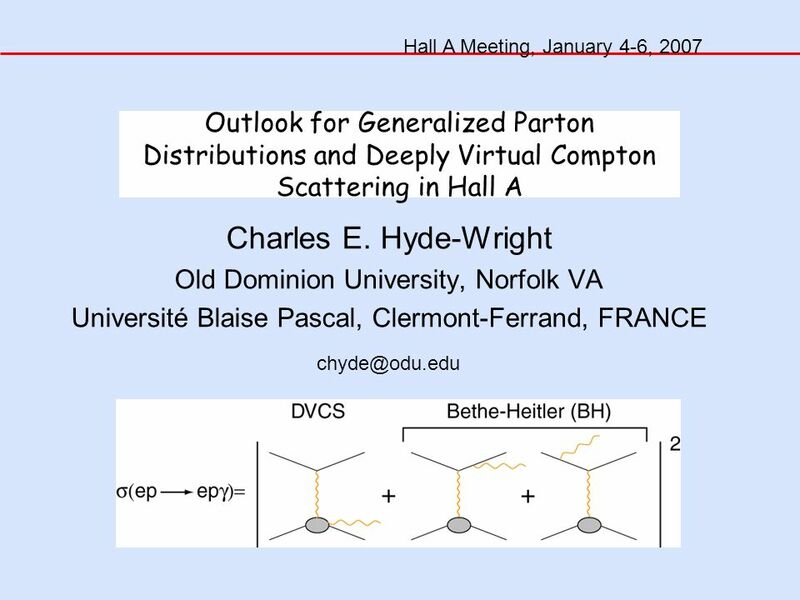 Download ppt "Outlook for Generalized Parton Distributions and Deeply Virtual Compton Scattering in Hall A Charles E. Hyde-Wright Old Dominion University, Norfolk VA."
P-Y BERTIN Jefferson Laboratory and Université BLAISE PASCAL- IN2P3/CNRS for the DVCS HALL A collaboration 0 exclusive electro production Q 2 =2.3 GeV. 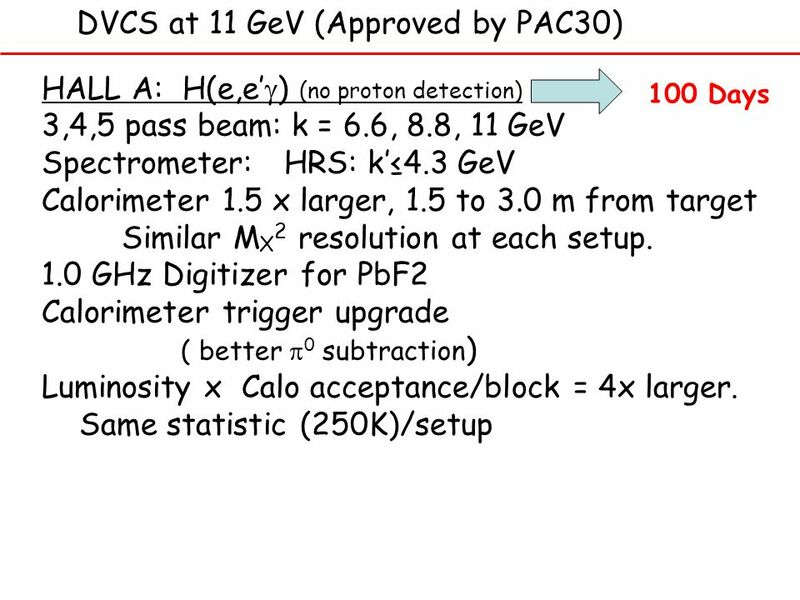 Status Report of the measurement of G E n via 3 He(e,e´ n) Robert J. Feuerbach The College of William and Mary for the E Collaboration. 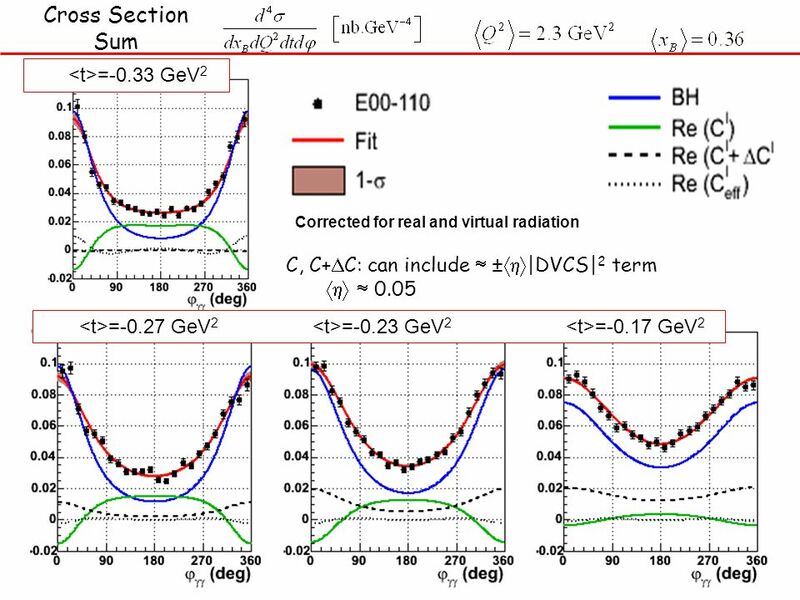 Deeply Virtual Compton Scattering on the neutron in. 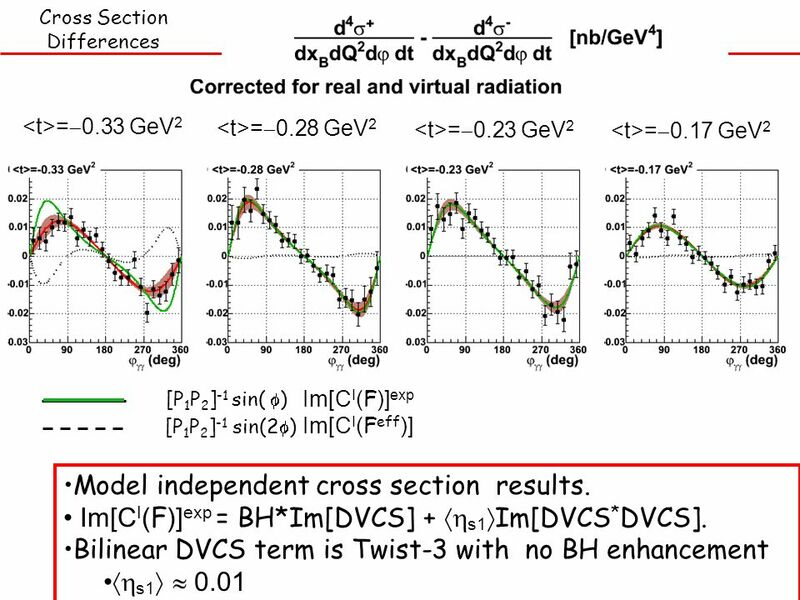 Dr. Malek MAZOUZ Ph.D. Defense, Grenoble 8 December 2006 GPDs Physics case n-DVCS experimental setup. A future n-DVCS experiment in Hall A Malek MAZOUZ October 15 th 2007 What was done in E Motivations Experimental upgrades Projected Results DVCS. 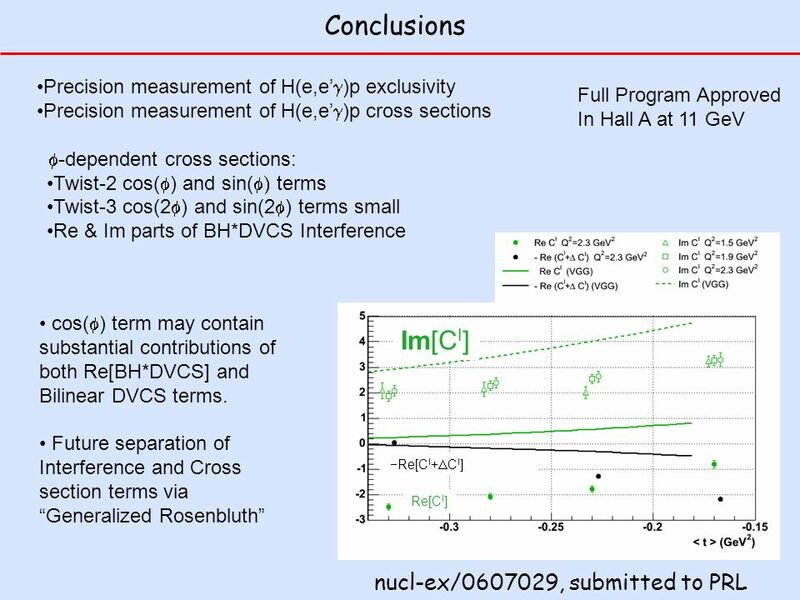 L/T separation in the 3 He(e,ep) reaction Javier R. Vignote and Eric Voutier Laboratoire de Physique Subatomique et de Cosmologie, Grenoble, France Jlab. 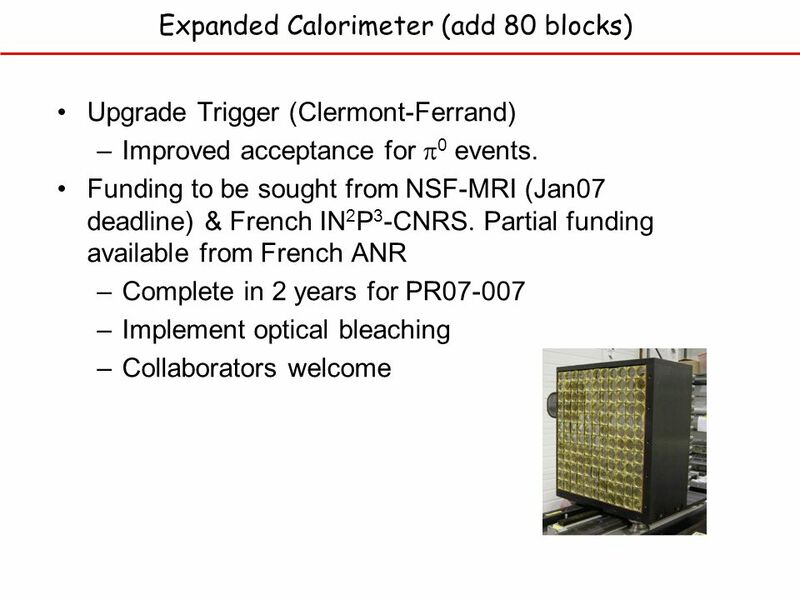 P-DVCS and n-DVCS experiment status -Brief overview of the theory -Experiment setup -Analysis status Malek MAZOUZ LPSC Grenoble Hall A Collaboration MeetingJune. Measuring the Neutron and 3 He Spin Structure at Low Q 2 Vincent Sulkosky College of William and Mary, Williamsburg VA Experimental Overview The. Measuring the Neutron and 3 He Spin Structure at Low Q 2 Vincent Sulkosky for the JLab Hall A Collaboration College of William and Mary, Williamsburg VA. Deeply Virtual Compton JLab Franck Sabatié CEA Saclay On behalf of the Hall A and Hall B collaborations Pacific Spin 07 - Vancouver August. 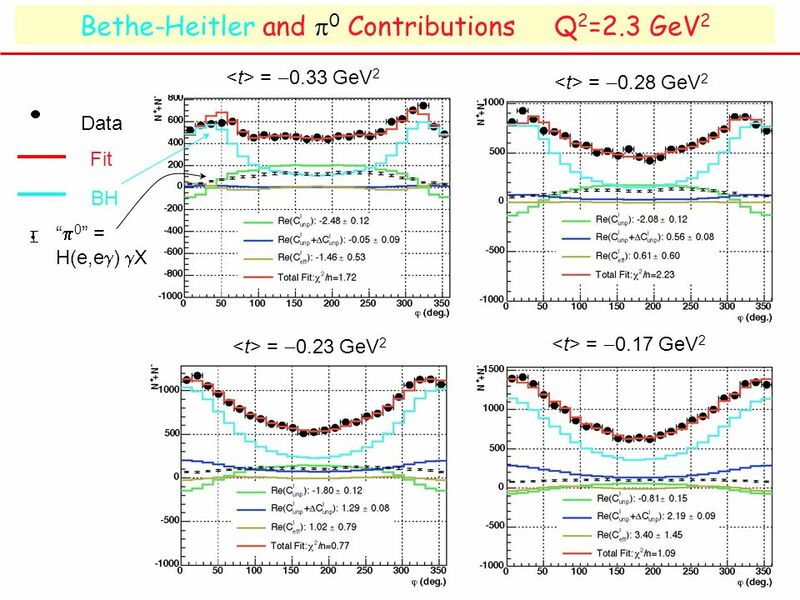 Luca Stanco - Padova Heavy Quarkonium, Fermilab 1 Charmonium Production at HERA Luca Stanco – INFN Padova Outline: Introduction J/  Production Mechanisms. 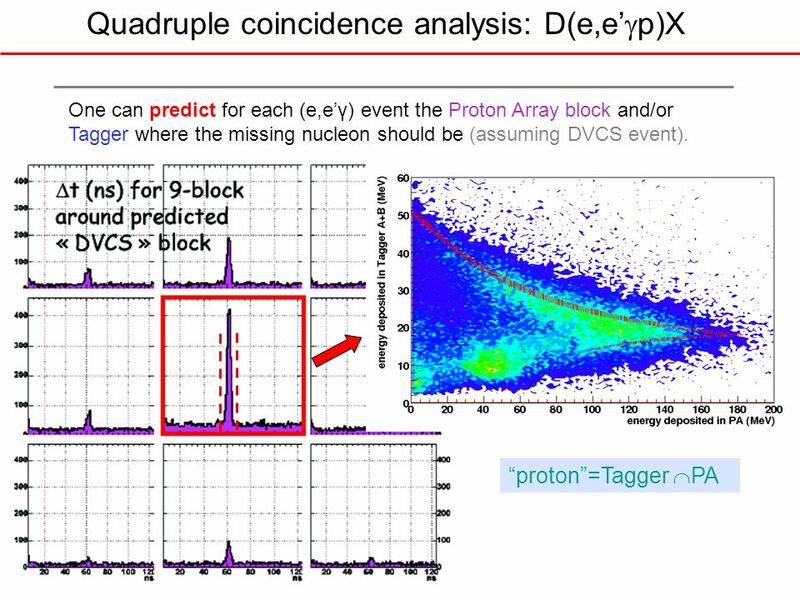 Deeply Virtual Compton Scattering on the neutron with CLAS12 at 11 GeV k k’ q’ GPDs nn’ Silvia Niccolai CLAS12 Workshop, Paris, March 8th 2011. Jin Huang PhD Candidate, MIT For MENU 2010 May 31, Williamsburg. 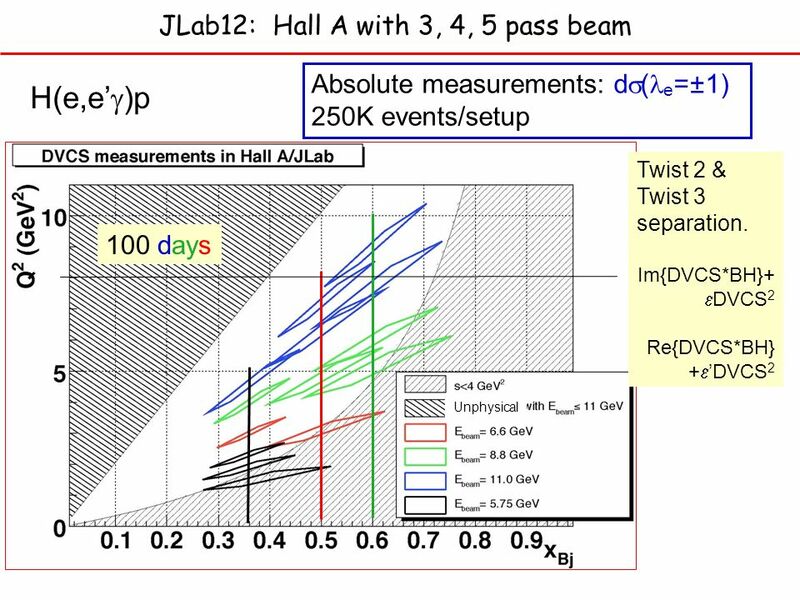 Envisioned PbWO4 detector Wide-Angle Compton Scattering at JLab-12 GeV with a neutral-particle detector With much input from B. Wojtsekhowski and P. Kroll.